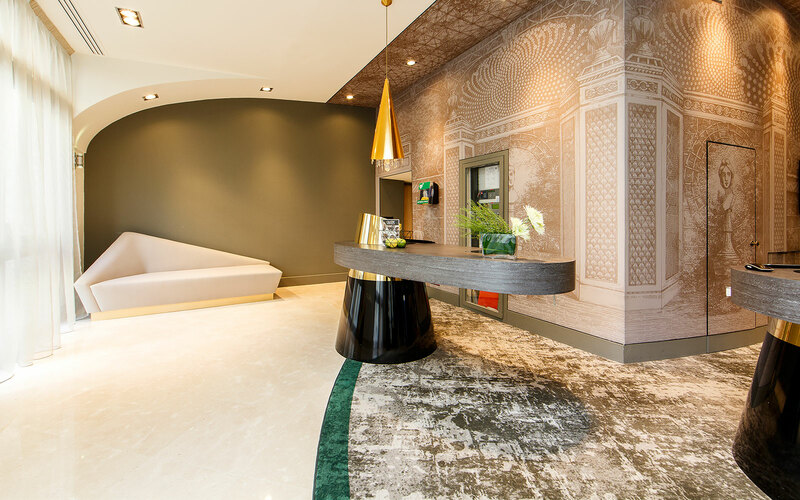 The design idea for Hotel Le Louis Versailles Château MGallery by Sofitel materialised in French crystal, antique mirrors and moldings that are mixed and matched with elegant pieces of furniture and modern materials such as concrete, but also photoprint and art. Sundukovy Sisters design studio decided to install carpet on the existing floor as this solution is effective in terms of budget and timing. 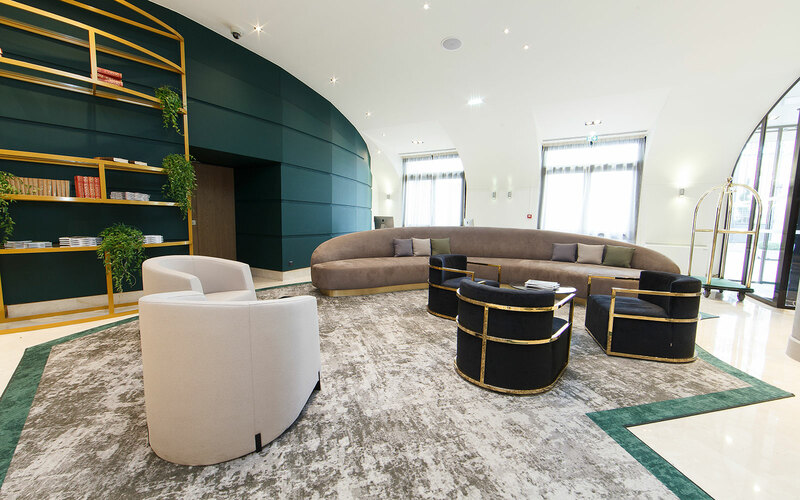 At the same time, ege’s custom carpet design options were very appealing to the design studio, as the desired pattern comprised a paraphrase of the iconic landscape of the Gardens of Versailles. 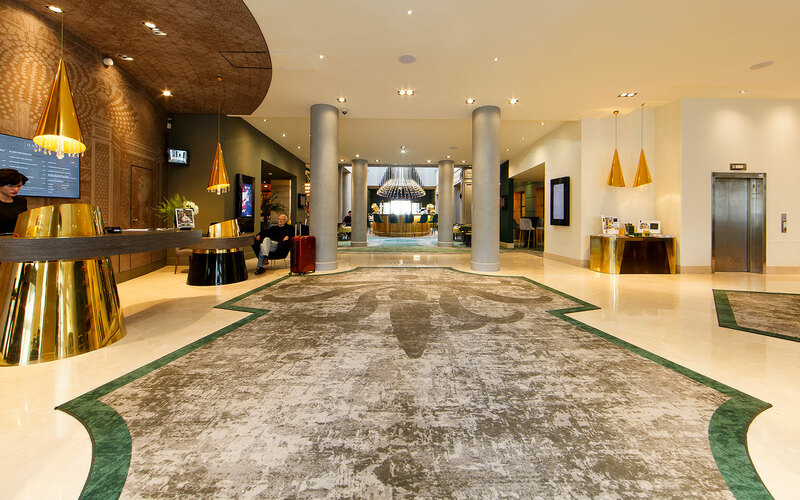 A rich emerald-green colour combined with a concrete inspired texture create an elegant and luxurious setting in the hotel’s reception and lounge areas. The royal ambience of the carpet design reflects the famous lawn pattern of the gardens and compliments the rest of the interiors perfectly. A look of aged concrete is transferred to the walls too and blends in beautifully with the décor in antique gold and dark green, the colors of the Versailles parks. Moreover, reception desks with cone shaped elements represent the cone-cut trees in the gardens of Versailles. A bespoke ceiling painting features a design from one of the Versailles Palace rooms, perfectly in line with other decorative elements in a concrete like texture. One of the highlights in the lobby interior is the chic bar’s stunning chandelier imitating the form of the roof of the classic palace. Using classical textures in a contemporary surrounding allowed us to implement the design idea. We focused on baroque ornaments and elements, made in contemporary materials and added a note of irony, which is typical for our style. We brought the stylised patterns of the Gardens of Versailles greenhouse into the interiors. Thus, the hotel interior mirrors the location and becomes an important part of the hotel stay. Want to tell your own story? Interior designers sometimes believe that custom design carpets are quite complicated. If you were on your own, custom projects could indeed be challenging, but we are here to guide you all the way and you can leave as much of the work as you like to us. If you have an exciting story to tell about location, history, profile or something completely different, we are here to help! 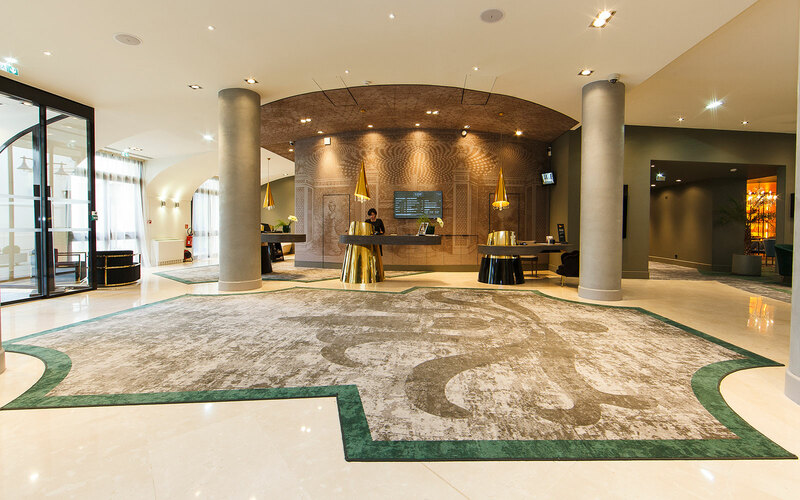 Want to learn more about the creation of a bespoke carpet design?